Information. Shows a dialog with information of the current window and process: the window handle, the window caption, the window style, the window class, the process name, the process id, the path to the process. Always On Top. Allows the current window to stay on top of all other windows. Save Window Screenshot. Allows to save the current window screenshot on a disk. Resize. 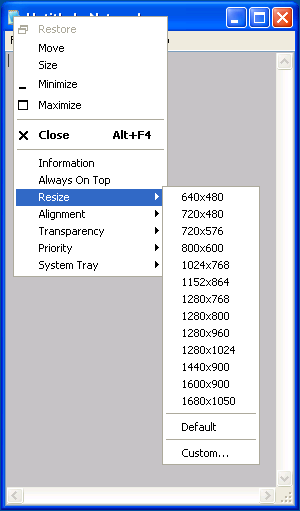 Allows to change the size of the current window. Alignment. 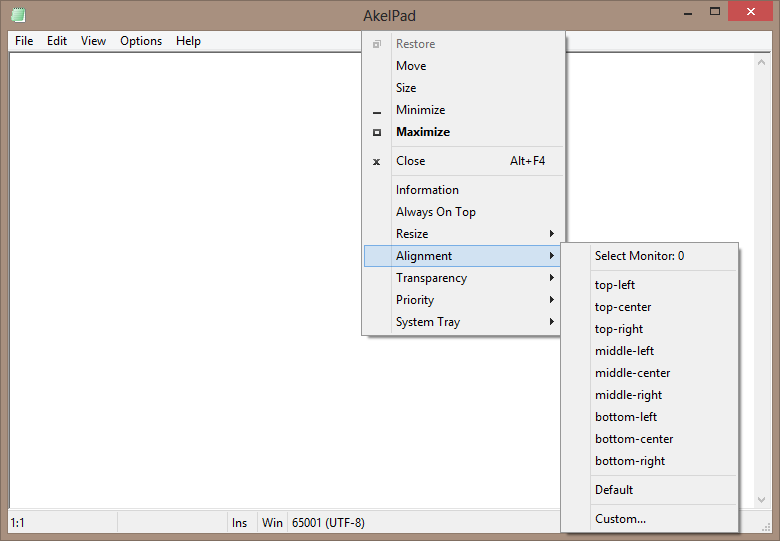 Allows the current window to be aligned with any of the 9 positions on the desktop. Transparency. 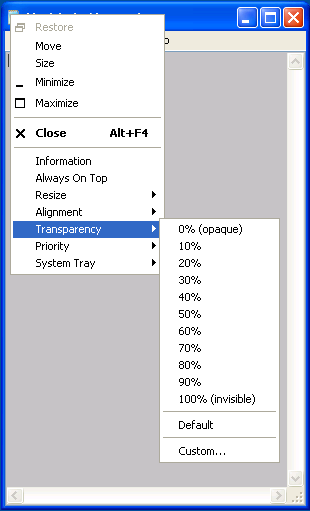 Allows to change the transparency of the current window. Priority. Allows to change the current window's program priority. System Tray. Allows to minimize the current window to the system tray. OS Windows XP SP3 and later. Supports x86 and x64 systems. The only snag for me is the memory footprint -- it's 10 times that of Sizer (viewtopic.php?t=17028), which I use in all my systems for the "Resize" and "Alignment" functions of SmartSystemMenu. I have been using SmartSystemMenu for quite some time (since 2015-07-18) and for me this is absolutely indispensable tool. It was in my submission list (together with hundreds of other programs) but I never found time to review it. Version 1.0.5336.20780 (from 2014-08-11) works just fine for me and I do not plan to update it unless some new features I need would be added. What I miss is roll-up feature. In regard to memory usage the program is more than modest- on my system (Windows 8 x64) it uses about 6 MB of RAM. SmartSystemMenu was originally hosted on CodePlex. If someone adds SmartSystemMenu to the database I will vote for it. Thank you for taking your time to review the program in the forum and to add it to the database, you spared me some time. In fact SmartSystemMenu is one of my greatest ever favourites and it is a shame that I never posted about it here. I voted and it should be public now. Good suggestion. Thanks both of you for the suggestion + database addition. I'll be testing that out this week.